You know, bot-aspirancy is insidious. It starts with a little AFK mining here, a little autopiloting there. But bot-aspirancy always wants more. Before long, you won't even recognize yourself. If left untreated, a carebear can become like some of the people ganked by the New Order during the week of January 8th @ 00:00 EVEtime through January 14th @ 23:59 EVEtime. Only then is the true horror realized. Buckle up, it's about to get bumpy. 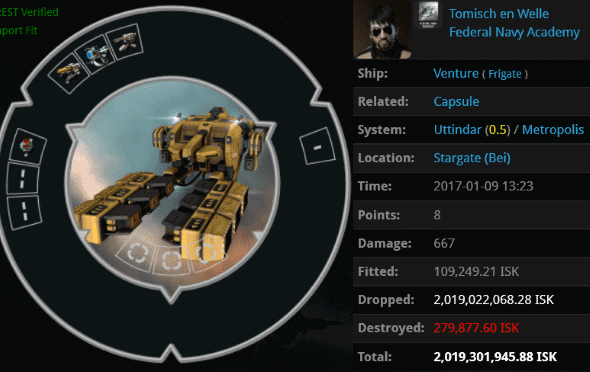 kidcash shocked highsec with his staggering 41 billion isk Bowhead loss. What more can we say about this incident? Agents Darnoth, ZAKURELL0 LINDA, Ido Adudu, Ganku Desu, SKAfan, Flamboyant Surprise, Ampelius Loukianos, Heisenberg Hemah, Ilsanore Lea, Lawrence Lawton, Reggie Thistleton, Bint Bint, Pardon The Interruption, Arobaz, Orn Ehmstein, Another ShadeOfWhyte, Eugenie Brazier, Morrigan Laima, Gea Stormbound, Shazna Solta, Joe Kouvo, Pure Whyte, 4R084Z, Mack Poddington, Explosive Mooses, James Poddington, Skiff Poddington, Hulk Poddington, Sorg-frae, Mon Mothmaa, Jack Spratley, SonicBlackRight, and Fat Tawate were on patrol in Niarja at the time, and thank goodness. I'm afraid it's true. 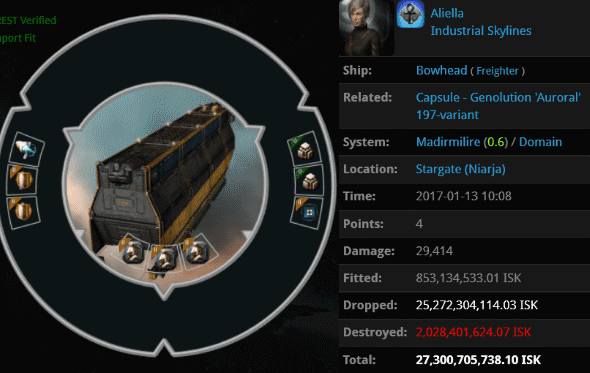 After kidcash lost a 41 billion isk Bowhead, he switched to his alt and lost a 27 billion isk Bowhead an hour and a half later. This guy seems determined to become the next X-FEANOR. Agents Arobaz, Another ShadeOfWhyte, Morrigan Laima, Pure Whyte, Bratok Srayona, ZAKURELL0 LINDA, eC Cade, Captain Edward England, Pig of Fury, Piper Banner, Darnoth, Bint Bint, Eugenie Brazier, Gea Stormbound, 4R084Z, Shazna Solta, Captain Cortar, Joe Kouvo, Pardon The Interruption, Sorg-frae, Synamic, Origo Lim, Disposable Cracker, Mon Mothmaa, and Dani Otsolen eliminated the second Bowhead--along with its 3.3 billion isk pod. Tomisch en Welle demonstrated why our Agents continue to destroy every Venture they can find. Agent Tisiphone Dira showed Tomisch no mercy but the mercy of the Code. Upon terminating Tomisch's fail-fit Venture, Tisiphone recovered a pair of PLEX. 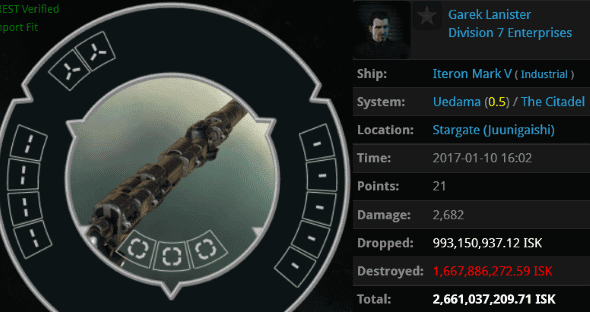 Some "new players" drop better loot than those fancy NPCs out in nullsec. Modules. Who needs 'em? That was the thinking of Garek Lanister, who waltzed into Uedama without a care in the world. Agent Votre Dieu quickly put an end to Garek's vulgar display. 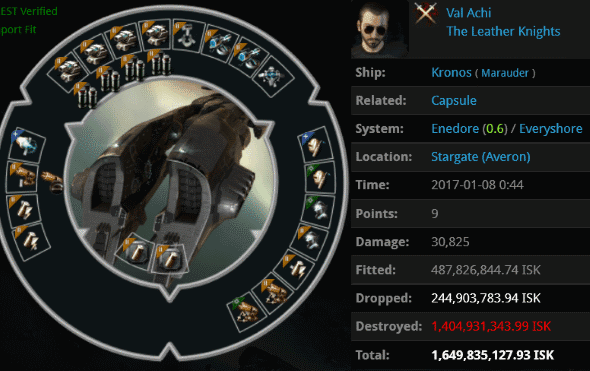 Val Achi's 1.6 billion isk Marauder was an expensive example of a combat ship with a capacitor tank. Agents Zane Arnolles, Jaxi Wreckful, Fiddly Pop, Jeni Savage, Lillie Naari, Ron Chi, and Jana Grebb were puzzled by what they saw. Was Val on drugs? Actually, he might've been. Val was indeed carrying a unit of drugs in his cargo. 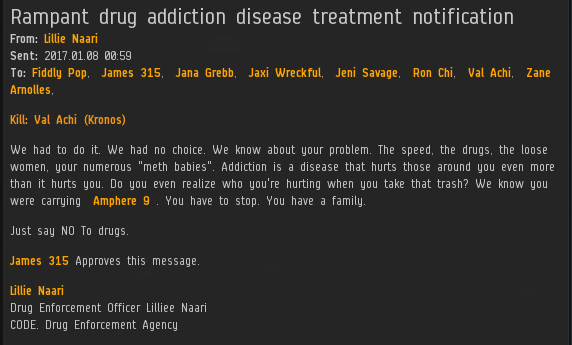 But as we all know, the most dangerous drug in highsec--the one with the deadliest of side effects--is bot-aspirancy itself. If you're mining in highsec and you take a bathroom break with your ship still sitting in the asteroid belt, it's basically a gateway drug. Before long, you'll find yourself losing everything you own in an AFK Bowhead. Agent ST0NER SMURF and his friends have been very busy of late. jacquelynn a bolton was one of countless pilots to be podded by them last week. 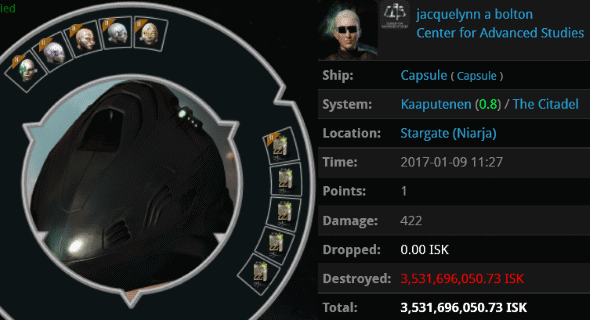 She was AFK autopiloting in a naked 3.5 billion isk Capsule. Pretty reckless behavior. Did jacquelynn plug in that Slave Beta implant instead of a Snake one by mistake? I suppose it doesn't matter now. All those implants are gone, so jacquelynn can start fresh. 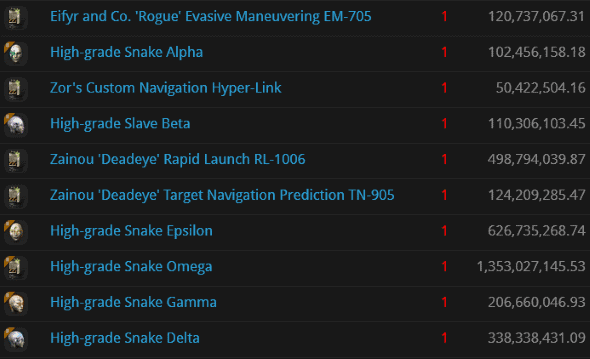 I hear New Order mining permits are on sale... Only 10 million isk! No new kills! Your gone for good and good riddance! It's time for new leadership! Leadership that won't get everyone banned. Three or four of those ridiculous Bowheads simultaneously undocked from Jita and flew in convoy toward Niarja. The two most valuable them were intercepted by Miniluv and bumped. The first was ganked immediately while the second managed to safe log. A Minister camped the spot where the second had last been seen and caught it when it logged back in. So out of 4 you guys only killed one! That is really sad indeed. Sounds like Wolf/Loyal is not in the game AT ALL. Also sounds like you guys had problems from AG again, like last week. When are we going to end these miserable low lifes??? I'm tired of them messing with our game. 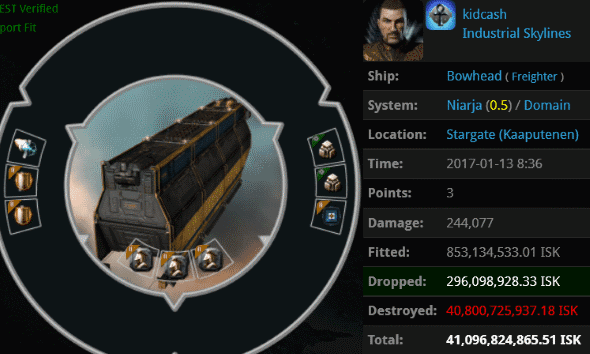 We used to wardec these guys. Two or three AG (Militia) at one point tried to gank one of the Machariel bumpers on a gate with their Taloses. When they aggressed, the Mach just jumped through and they all lost their ships. https://zkillboard.com/kill/59195141/. AG pretty much gave up at that point. Wolf is on the freighters again "gf"
logs or pics or it never happened!